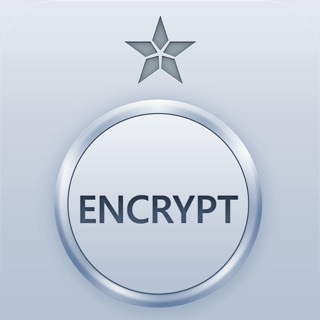 • Paranoia Text Encryption PRO is the universal text encryption application for iOS (iPhone/iPad/iPod) by Paranoia Works. • Paranoia Text Encryption keeps your notes, SMSs, emails, social networking posts, cryptocurrency keys (seeds, mnemonics), and any other text safe from all unwanted readers. 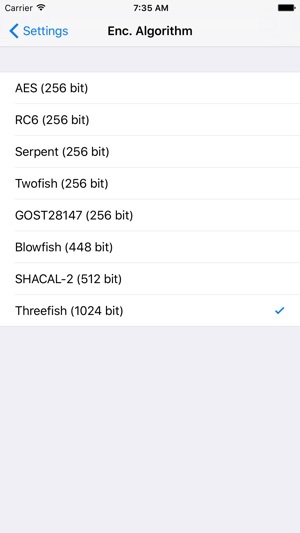 • The app provides real security as data is encrypted using strongest encryption algorithms: Threefish 1024 bits, SHACAL-2 512 bits, Blowfish 448 bits, AES 256 bits, RC6 256 bits, Serpent 256 bits, Twofish 256 bits, and GOST 256 bits ciphers are available. 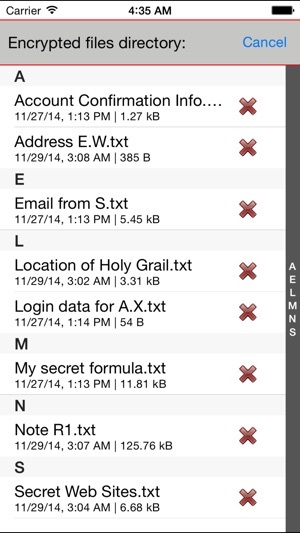 • Just copy and paste to and from your favorite applications or save to a file for later use. • The app does not work as a "Vault application". A password is not set to enter the application, but set for the current encryption/decryption session. You may have an unlimited number of passwords for any purpose (notes, emails, communication with persons A B C, ...). 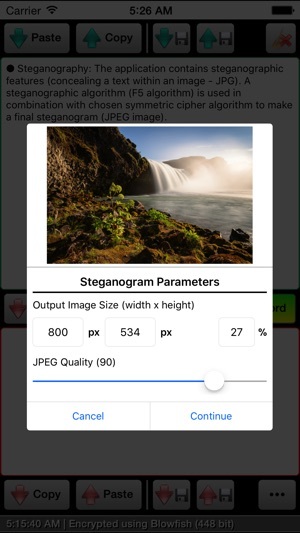 • Steganography: The application contains steganographic features (concealing a text within an image - JPG). A steganographic algorithm (F5 algorithm) is used in combination with chosen symmetric cipher algorithm to make a final steganogram (JPEG image). • A free cross-platform desktop version (Mac OS X, Windows, Linux, ...) is available on the app's homepage (download section). • We would appreciate any feedback from you regarding suggestions for improvement, reports of technical problems, and...., You are welcome to contact us via email. Especially if you want to ask a question, use the email. Comments do not allow us to communicate to you. • Updated data format (version 3). If you are a user of this application on another operating system, please update the application to the latest version. Unique amongst the encryption apps I've seen on the Apple App Store. It's the session by session of text and files, with infinite number of passwords/keys, that makes this special compared to the proliferation of password managers, etc. that are out there. You also have a wide choice of encryption methods. Most of those apps are encrypted "storage safes". This is way different than that. And the level of encryption available is more than enough for most people, particularly if you use a long phrase salted with random numbers and special characters standing in for letters to generate the encrypted text. And do check out the desktop version. 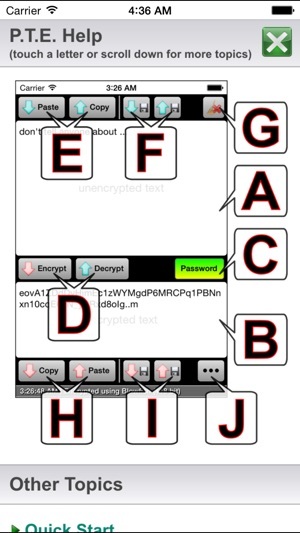 Where you can not only encrypt text you can create steganograms to hide your newly encrypted text. Bravo developer! Do you want to keep your information secure from the prying eyes of malevolent corporate state parasites and sociopathic cracker scum? Sure! We all do! This app was truly amazing until I discovered that it had been transferring data, presumably the private data that the app is supposed to protect, via my cellular network. Most folks that download an encryption app with “paranoia” in its name see absolutely no need whatsoever for an app to transmit data over the internet or otherwise. While I am fully aware that iOS allows me to toggle this app’s ability to communicate via cellular network, seeing that the app transferred nearly 2MB of data via cellular over about 4 weeks means I cannot trust it when connected to WiFi either. The developer could have easily siphoned my personal data (and could be siphoning yours if you’re using this app). Thank you for your response. Unfortunately, your claim that P.T.E. doesn’t transfer any data is untrue. According to my device’s cellular data meter, your app has indeed transferred data using my phone’s cellular connection. There are many apps on the App Store (some dealing with encryption like P.T.E. does) that do not transfer any data, thus producing no entry in cellular data settings. Not only has P.T.E. produced an entry, it has transferred 2MB of data. Perhaps this behavior is totally innocuous. Perhaps you are totally unaware. Perhaps a library you’ve incorporated is unknowingly establishing a connection. Or, perhaps you are stealing users’ data. As someone that depends on security and privacy, I cannot afford to take that gamble. Like I said, your app is fantastic, but it simply isn’t worth the risk, given your unsatisfactory explanation. Until a better explanation is offered, my review will remain a 1-star. I am changing my review to a 5-star due to this application having proven (after an update removing the Appirater component) that it no longer transfers data via cellular network. Thank you for providing a satisfactory reason for the occurrence of network data transfer, and thank you for removing the offending component. This app does not transfer any data. Images for steganography (if you use this feature) are only external data used by the application. App's data are also backed up to your iCloud (if it's enabled), but it isn't done by the app itself (it's a system feature). Any other component that could probably use network data was Appirater (already removed). If you have some concern about your security, please contact Apple directly to investigate the issue (report this application as a spyware, since that's your accusation here), we have nothing to hide.